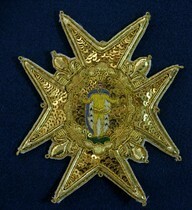 Napoleon reintroduced military decoration (Légion d'Honneur). 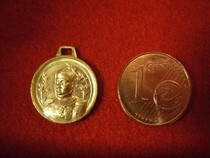 Dignitaries of all european courts exchanged their decorations, we reproduced them. The dream of every Napoleonic soldier. Somebody said that "every soldier had his stick in his pouch". You can choose between a "plain " one, brass extremities without gold, and without engravings( it really existed) , or one gold plated with engravings. Top extremity will be engraved with the following sentence: TERROR BELLI , DECUS PACIS. 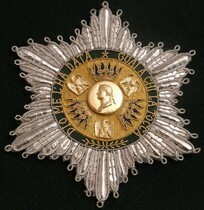 Lower one with name, surname and date of nomination. 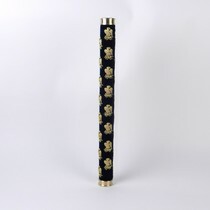 32 gold and silk embroidered eagles on blue velvet, 48 cm long, 4,2 wide. 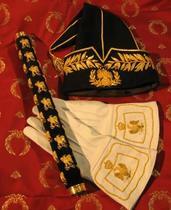 The "must" of any Napoleonic collection . 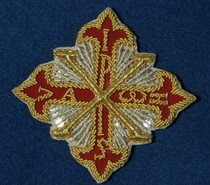 GREATEST CHOICE IN THE WORLD FOR COPIES OF EMBROIDERED DECORATIONS! 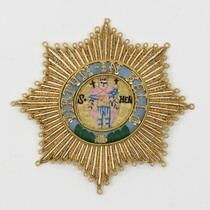 Medaille de saint helene, original decorations with old or recent ribbons, price by one. 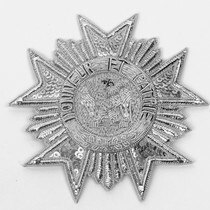 Attributed during second Empire to survivors of the Grande Armée. 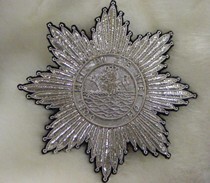 Crown is not the original one, enamel has been repared and ribbon is new...Price in accordance. 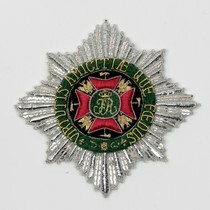 Baltic (1854-1855), 16 mm, without ribbon. One exists without engraving (for Davout, because he lost it). Usually extremities are engraved. 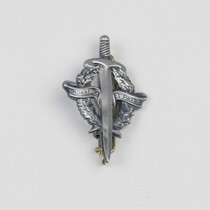 One with the motto "TERROR BELLI, DECUS PACIS". 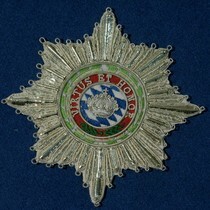 The other one with the name of the marshall and date of attribution. 48 cm long X 4,2 cm diameter. 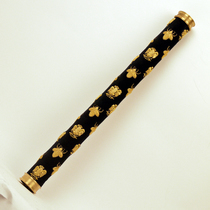 Gold-plated and engraved marshall baton. No difference with an original, except goldsmith stamp....and price! 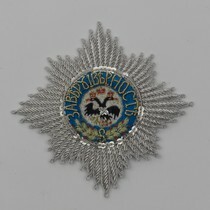 32 eagles embroidered in gold thread on a dark blue velvet. Delivery time: more than 6 months! 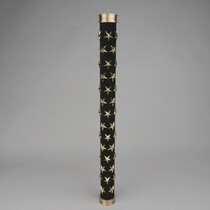 In this case he had a very special stick, with eagles and bees. 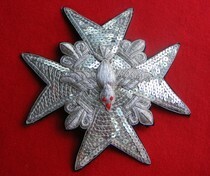 Copy of an original from Comte de Choiseul-Stainville(1727- 1789), maréchal de France on 13 th june 1783. 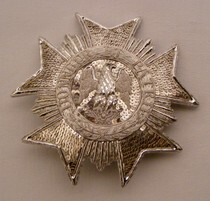 Used by Duroc(Grand Maréchal du palais) or Ségur (Grand Maitre des cérémonies), for instance. 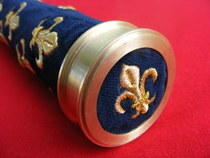 Bronze pommel, bees on blue velvet. 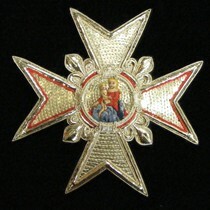 "grand cordon de grand croix de la legion d'honneur"
Very rare reproduction of jewel of "grand collier" (80 mm large) sold with "Grand Cordon" (usually with 70 mm large jewel). 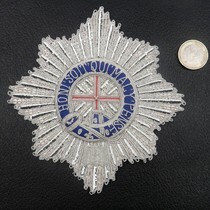 37 mm diametre, topped with a crown, silver aspect, no tie on ribbon. 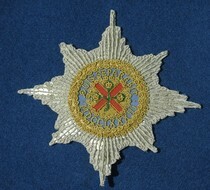 37 mm diametre, topped with a crown, goldplated, sold with ribbon decorated with a small tie. One of the best copies ever made, compare price & quality with precedent copies.ON STOCK! 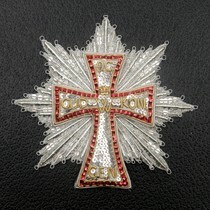 Indicated price is price for ribbon only, you can also buy the jewel with his rubbon in our website. 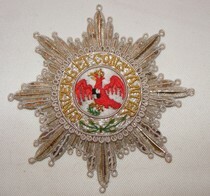 "Plaque de grand aigle", Légion d'Honneur, all embroidered . Attributed to all marshalls and most important people. 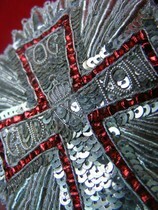 Silver thread on silver spangles. 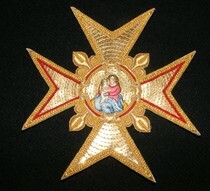 Copy of a very rare decoration, attributed to Cardinal Fesch, uncle of Napoleon and some roman dignitaries. 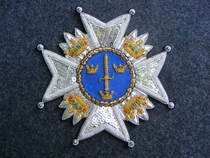 Legion d'honneur for all marshalls for instance. 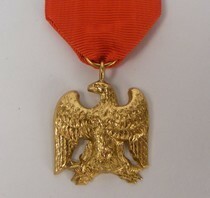 Small default on left of letter "E" of PATRIE. Sold in this condition, it looks more like a genuine one! 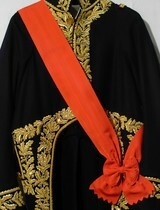 France court coat decoration of "grand croix de la legion d'honneur"
This decoration was sewed on court coat and is extremely rare. 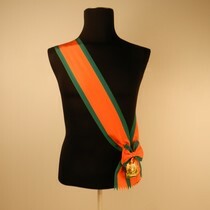 Orange ribbon with green border, 110 mm large, 160 cm long. 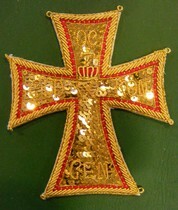 Colour is the exact colour, compared with original ribbons protected from light. 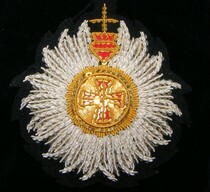 When created, on june 5th 1805, the " grand cordon", attributed to first 20 dignitaries, was embroidered with 3 crowns, head of the emperor in the middle. 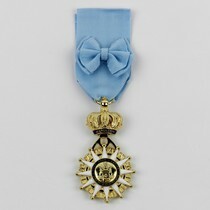 Very quickly, this "grand cordon" was used without these crowns to suspend the jewel of the 35 dignitaries finally created after 29 th december 1807. We suppose that dignitaries who had first grand cordon with crowns kept it and added first the jewel at extremity when it appeared. So we propose it with or without jewel. 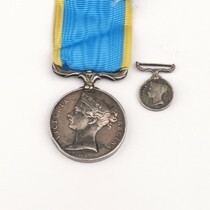 31 mm high, 28 mm large. 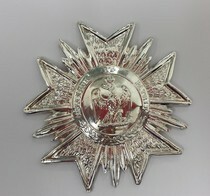 Silver colour is colour of a new decoration. 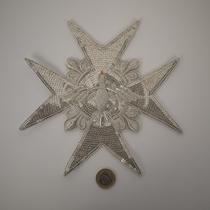 Grey colour appeared after years, we sell this decoration as if it was old. 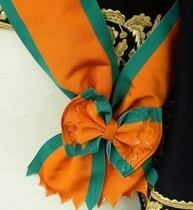 Colour of ribbon is the real colour of the genuine ribbon: ORANGE AND GREEN. Colour passed on old decorations but regulation instructions indicated orange and green. 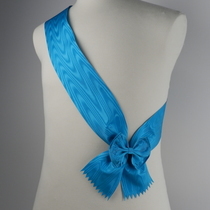 Sold with ribbon with "tie"
Ribbons can be sold with or without tie. The colour is really orange with 2 green stripes. 38 mm large. 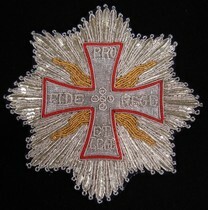 Picture of a ribbon, made in 1905, indicates real colour. Price is price of ribbon, alone. Of course, jewel is not included in price. 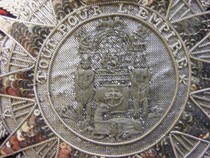 Text on this decoration could be written in french or italian, we propose here the french version. 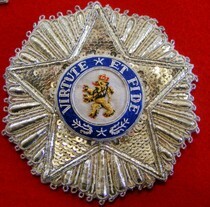 Couronne de fer in italian, "dio me la diede"
Text on this decoration could be written in french or italian, we propose here one of the italian version . 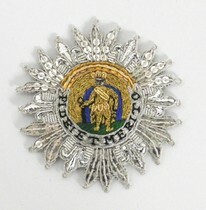 Iron crown in italian, "dio me l'ha data"
Decoration of "couronne de fer" for eugene de beauharnais and dignitaries. 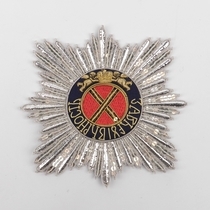 Proposed by the emperor to his adopted son who was vice king of Italy , from a genuine one described by Guy Deploige in his book about collection Brouwet. 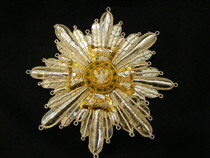 Such a decoration have been used by GIUSEPPE PRINA, minister of italian kingdom and have been recently sold (Etude Binoche et Gicquello, auction 20th june 2012). "DIO ME L'HA DATA, GUAI A CHI LA TOCCHERA"
Following Napoleon's defeat and the incorporation of the province of Lombardy by Austria the Order was reinstated on the 1st of January 1816 in a new form. 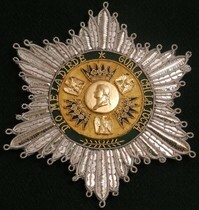 Motto " AVITA ET AUCTA"
12 haches d'abordage d'honneur are known, 4 are in museums. 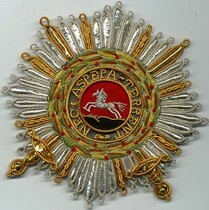 Brother of arms, copy of medals of "Débris de la Grande Armée"
At the end of Empire, soldiers of Grande Armée met themselves inside brotherhoods, who used symbols of fallen Empire.. 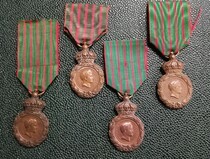 This medal is a copy of these particular medals. Made in France from a very ancient mould. 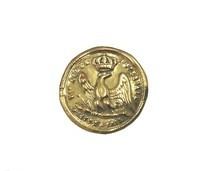 Dimensions of eagle: 29 X 32 mm. 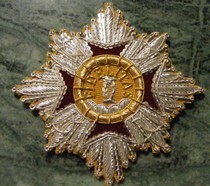 You, who took part to re enactments more than10 years long, you surely merit this decoration! 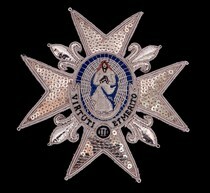 France: ordre des palmes academiques brodees, "legion violette"
French decoration instituted in 1808 to honour eminents members of university. 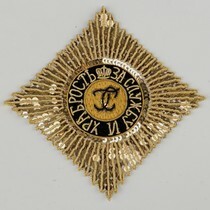 2 ranks: violet silk bordered with silver(officer of university) or gold (grand dignitaire). 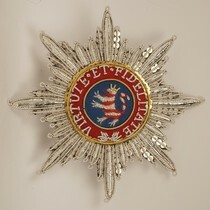 Created by Napoleon when Holland was added to French Empire, 18th octobre 1811. Suppressed 28th july 1815. 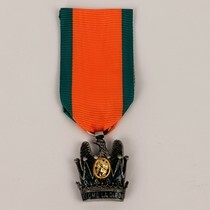 Order of the Réunion or Saint Esprit: Ribbon without "Grand croix"
Created by Napoleon when Holland was added to French Empire,18th octobre 1811. Suppressed 28th july 1815. We sell ribbon alone. 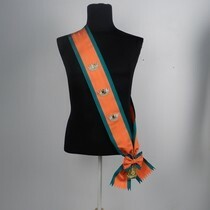 Fits also for "Order of the Saint Esprit"
Order of the Réunion: Ribbon with or without "Grand croix"
At the end of Empire, soldiers were sent back home and paid half of what they received when they were soldiers (demi solde). 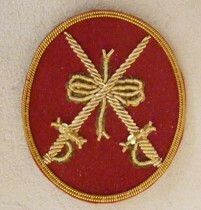 They liked to show that they still loved the emperor and used to sew at least one button of this type on their jackets. 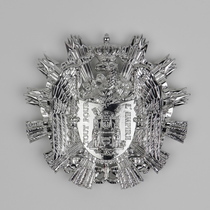 Diameter 25 mm, cupper slightly silverplated. 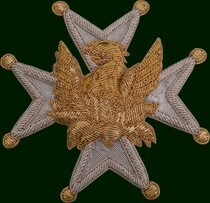 Lilly is the symbol of Bourbons de France . 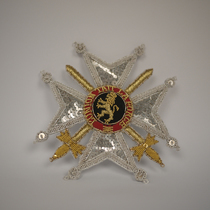 Created by Henri III in 1578, suppressed during revolution and reactivated by Louis XVIII. 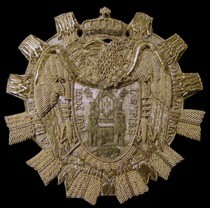 A painting by Bose represents Louis XVI with the same decoration, with a gold bird instead of silver. 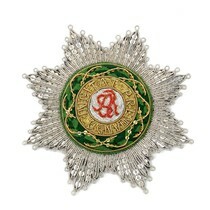 Created by king Louis XV for "bas officiers" for 24 years in the army. Created by king Henri IV in 1607. Copy from an original decoration belonging to Antoine-Nicolas de Sancières, marquis de Tenances. You can see the original one in the very precious book of Mr Jean Pierre Collignon: "Ordres de Chevalerie"
Created by king Henry IV in 1607. Confirmed by pope Paul V on 16th and 27th february 1608. "ATAVIS ET ARMIS". 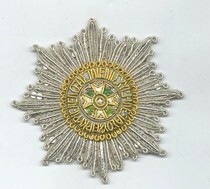 Size 9X 9 cm. 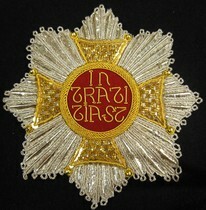 Order of Saint Louis was reserved to catholiques, it was necessary to give decorations to protestants (swiss régiments for instance), who distinguished themselves for France. 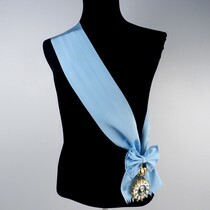 Mérite militaire was created especially for them . 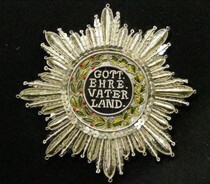 Created 12th august 1815 by Georges IV prince and next king of England to honnor his ancesters, princes of Hannover. 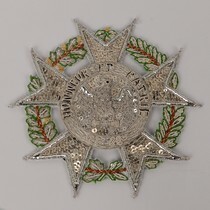 Institué le 18 juin 1757 par l'Impératrice Marie - Thérèse en souvenir de la bataille de Culloden. 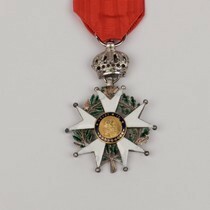 Ordre conféré exclusivement aux militaires. 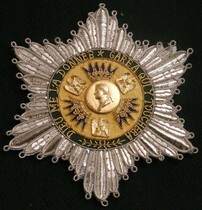 Il leur confère la noblesse héréditaire et le titre de Baron (suivant le grade détenu). 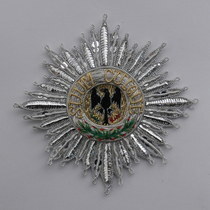 The Order of the Zähringer Lion was instituted on 26 December 1812 by Karl, Grand Duke of Baden, in memory of the Dukes of Zähringen from whom he was descended. 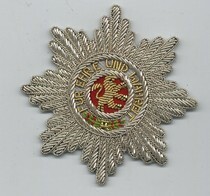 Around the circle is the order's motto, FÜR EHRE UND WAHRHEIT (FOR HONOUR AND TRUTH). 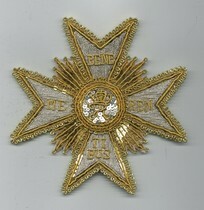 Bade: great cross of "order of fidelity"
Baviere: military order of maximilien joseph. Created in 1444, on the day of Saint Hubert, stop to exist between 1489 and 1708. 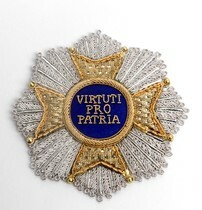 Created on 19 may 1808 by kingi Maximilien Joseph of Bavaria for civilian merit. Copy of a genuine one sold by "étude De Maigret" 18th novembre 2009, expert B Croissy. 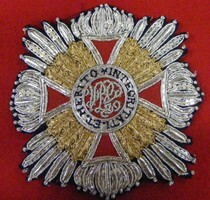 Danish order, created in 1671, modified in 1808. WE RE CREATED A NEW TYPE, PRICE OF LAST ONE IS REDUCED. 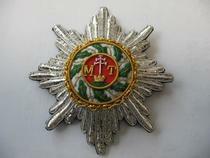 Copied on Nr 421 of auction, De Maigret du 23/11/2012, expert B Croissy. Order created on 19th September 1771 by king Charles III of SPAIN, by the occasion of birth of his grand son, infant Charles Clément. 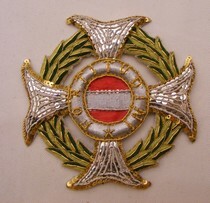 This decoration was offered by Marie Thérèse of Austria. Hungaria and austria were ruled by the same Emperor. Created in 312, according to tradition, real institution was acted by Isaac II Angelo Flavio Commene whose family disappeared in 1697. Created 7th may 1765 by Stanislas Auguste II Poniatowski, king of poland. 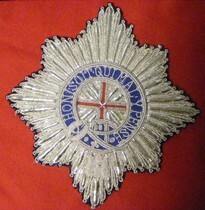 Order disappeared when Poland was divided, but was used between 1809 and1815 during dukedom of Varsovie. 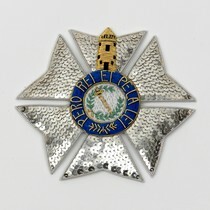 Created by regent prince Dom Joao, in Rio de Janeiro where he took refuge, on 13 th may 1808 to commemorate arrival of royal family in Bresil after Junot invaded the country. 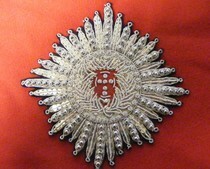 Created in 1319, renewed in 1789 by Marie du Portugal. 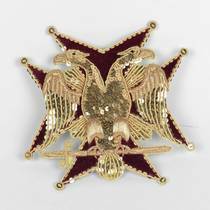 Bessieres, Davout et Lannes were decorated (28/12/1806). 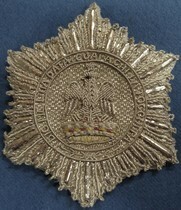 ONE OF THE MANY DIFFERENT TYPES OF THIS PRUSSIAN DECORATION. 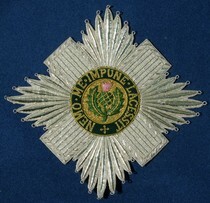 United kingdom/scottland "very ancient and noble order of the thistle"
Motto "QUID SEPARABIT", created 1783. 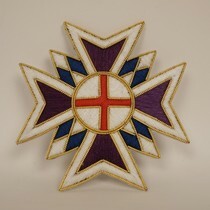 Order created on 18 may 1725 by king Georges Ist. 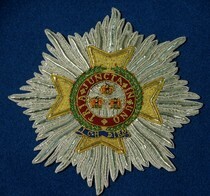 Motto: TRIA JUNCTA IN UNO". 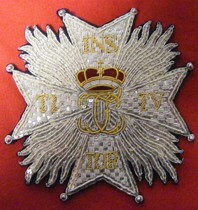 3 crowns are symbols of union of crowns of England, CScottland and France(!) then Ireland replaced France. Type of letters is different of 19 th century. Size in biggest dimension: 10 cm. Second picture is from an original one. Size in biggest dimension 10 cm. 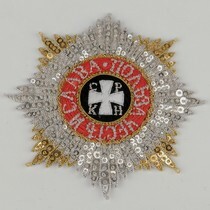 Attributed to tsar only, who was a relative of english royal family. 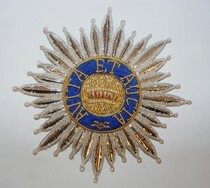 Created on 21th may 1725 by Catherine Ist. 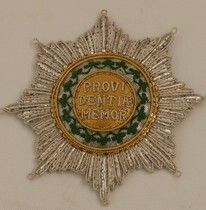 Attributed to most important personnes of the state Suppressed in 1917. 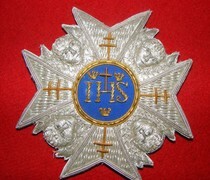 Order of Saint-Joachim (Equestrian, Secular and Chapterial Order of Saint Joachim) is a chivalry order created in 1755 by nobles and soldiers of Saint-Empire romain germanique under the name of" The Knights of the Order of Jonathan, Defenders of the Honour of Divine Providence". Horatio Nelson was his most famous member. 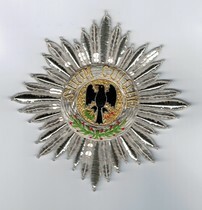 Decoration from one of the numerous states existing before German unification. 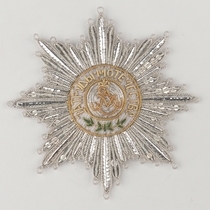 Created 7th octobre 1739 by the elector of Saxe. 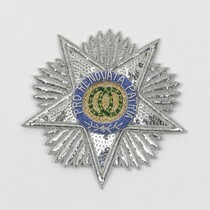 5 branches star with the motto in the center: "PRO RENOVATA PATRIA" . 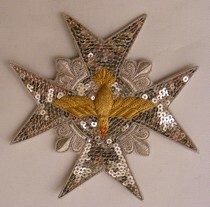 Silver embroideries 10 X 10 cm. 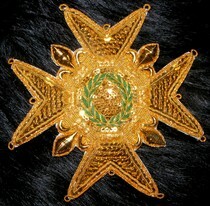 We improved the center, which is now embroidered instead of being maid with a piece of golden fabrics. 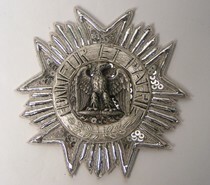 1st type, silver and gold, period of Frédéric 1st(1806/1818). 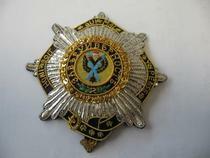 Copied on a decoration sold by De Maigret on 23/11/2012, expert B Croissy. 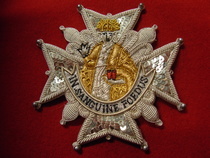 Lefebvre Desnouettes(1773/1822) had this decoration, see painting by Wengandt in 1807 (musée de l'armée, Paris). 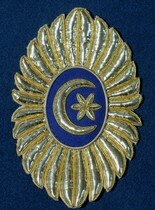 Instaured by sultan Sélim III in 1801, this distinction was only attributed to foreigners. 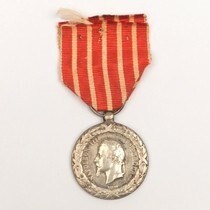 Admiral Nelson received after his victory of d'Aboukir (1st august 1798). 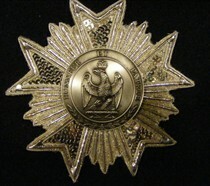 Brass medal. 2 sizes: 14 and 25 mm. 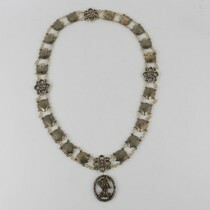 Very nice details, smaller size can be wear around neck. 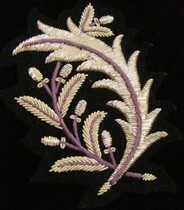 We can realise any type of embroidered decorations. You just have to send us a drawing or a picture with dimensions and requested colours. 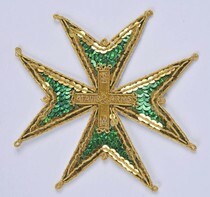 Decoration on picture cost 85 € for only one supplied, lower prices are possible for series. You can compare drawing supplied by our customer and the final production. Décoration "suprême conseil grand collège du rite écossais ancien accepté"